As was foretold by the ancients, Apple will hold its holiday iPad jamboree on October 22nd. We'll see some new tablets, sure. But there also might be a trove of other odds and ends awaiting us next week. While Apple normally plants hints of what's to come in its invites, it's not entirely clear that they have here; the color options are reminiscent of the iPhone palette, which could imply that the iPod touch is going to get a new color scheme, although there have been zero rumors to that effect. 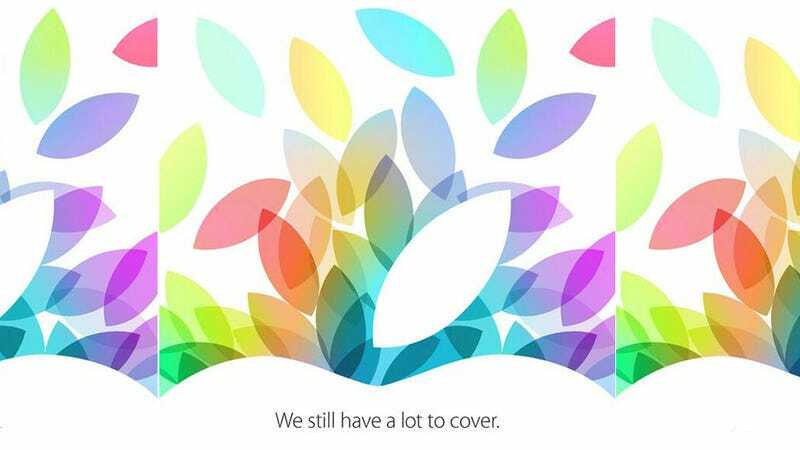 And the "have a lot to cover" could imply an improved Smart Cover design, or just an array of new Smart Cover colors. Or, you know, Apple's just got more to talk about. Let's start with the headliners; Apple's expected to announce an updated big-boy iPad with a trim-bezel iPad mini design tweak, and maybe just possibly a TouchID fingerprint sensor. The major question surrounding the iPad mini, meanwhile, is whether it'll finally get a retina display. If so—and at this point, given display prowess of the Nexus 7 and Kindle Fire HDX, it would almost be embarrassing not to—you can expect it to pick up a bit of extra chunk to accommodate a bigger battery. Both tablets should also get the bump to the iPhone 5S A7 guts, and both should be available in space grey or white. Basically, though, you should expect the same iPads you've become accustomed to, which is totally fine and good because iPads are totally fine and good products. But since a refresh does not a press conference make, what else might we expect? Apple's still got plenty of unfinished business from this summer's WWDC to address; we should expect final info and a release date for OS X Mavericks, and more details about the availability of that cylindrical Mac Pro it showed off. There's also an outside shot we'll see an Apple TV refresh, if for no other reason than that it's been a year since its last update. If it does happen, expect it to be minor; it's not like Apple's going to put out a hockey puck that streams 4K. Lastly, we should be seeing MacBook Pros finally getting a bump to Intel's Haswell chips, a long overdue upgrade that might not be worth a main stage slot, but could easily tie into a Mavericks update. Other than that? Your guess is as good as ours. Whatever Apple's got in store, we're just a week away from finding out.